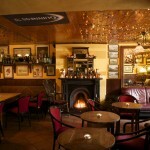 Enjoy a warm welcome in O’Donnells Bar – a historic inn which since 1802. 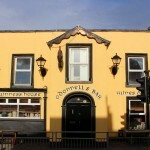 The Cliffoney Inn (now O Donnells Bar) was built in 1802 by British Prime Minister, Lord Palmerston (then Viscount Ashley). Lord Palmerston’s grandfather had been granted the title of Viscount Palmerston on 12 March 1723 and was also made Baron Temple, of Mount Temple in the County of Sligo, 12,000 acres which included the lands at Cliffoney and surrounding area. The Inn was his first home in the area and he resided here before building Classiebawn Castle at nearby Mullaghmore. 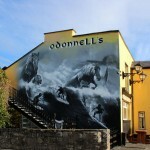 The extension was added in 1836 by the renowned builder Alexander Nimmo whose cantilevered stone staircase remains untouched and is still in use in O’Donnell’s Bar today.Palmerston had Nimmo build the harbour in Mullaghmore and also provided a narrow gauge railway to bring the barytes Mineral from the mines on Gleniff to the harbour. it is said the ghost of Palmerston still haunts the Pub but we would say it is a very friendly presence. During the Civil War the roof parapet was used by the freedom fighters to fire on the constabulary barracks across the road. 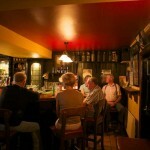 The Pub was the Residence of Lord Palmerston until he built Classiebawn Castle in Mullaghmore.